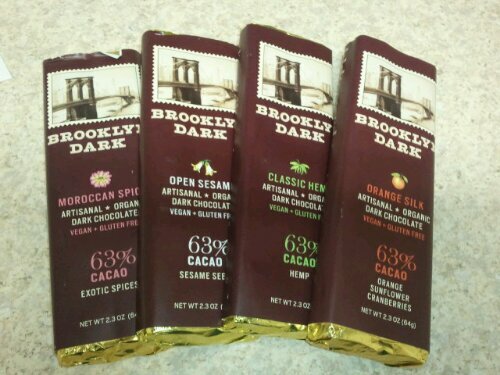 Brooklyn Dark – Artisanal, vegan, organic chocolate in unique flavors! When vegancuts.com asked me if I wanted to check out some new vegan dark chocolate, I went on Brooklyn Dark’s website to learn more. I’m not usually the biggest sweets person, unless it’s holiday time. Coincidentally, I entered holiday mode a couple of weeks ago. The catalyst was definitely seeing all the Halloween stuff out at stores, which by the way is torture, because of our impending move. We’re supposed to be scaling down, not buying new things! And if you know me at all, you know that Halloween is my favorite time of year to buy things like kitchen towels, place mats, throw pillows, socks, etc. and use these things year round. We are a very Halloween family. So what I’m really trying to tell you is that the timing couldn’t have been better. I was definitely in. Especially after I saw that they had some unique pairings, like sesame seeds and moroccan spice, for their 63% cacao hemp seed chocolate. Fast forward to yesterday. Four full-sized chocolate bars just waiting patiently for me to discover them in my mailbox. I’m not sure if they were actually delivered on Saturday, but regardless, they were clearly shipped with a frozen gel pack that had long since melted in the south Florida heat. No worries though, the chocolate was still in perfect condition, and didn’t show any signs of having melted. Next up was the Open Sesame. I liked this one much better. The sesame taste was much more subtle than its spicy sibling. I could taste the chocolate better in this one, and was pleased to find that it had a delicious, smooth flavor. It still had texture from the hemp and sesame seeds, but seemingly, not as much. The Classic Hemp proved to be the best of the lot for tasting their truly delicious chocolate. The hemp seeds are super subtle here, so you can just appreciate the chocolate, and let it melt in your mouth. Definitely a good choice for the purist. Orange Silk was a really pleasant surprise. From the name I was expecting an infused chocolate, but in actuality, it is like a fruit crunch bar experience that I LOVED. Cranberries, toasted sunflower seeds and orange zest are presented alongside the (yes, it’s true!) silky chocolate, and dispersed randomly so every bite is a little different. To me, it tasted like the holidays, and my dad’s cranberry orange bread. A very good thing. I decided to give everyone another go today before giving you the full report. I also decided to try them in ascending order of additional ingredients to give them all a fair shake. Classic Hemp was a nice smooth start. To me, it’s reminiscent of chocolate pudding or milk chocolate. I could appreciate the Open Sesame a little better in this order, and got that hint of tahini a little more clearly this time. I couldn’t wait to get into the Orange Silk. And compared to the other bars that had a teeny little piece missing, you could tell it was the one that I enjoyed most. There is only half a bar left at the time of this writing! 🙂 Yum, yum, yum! Last up was the Moroccan Spice. I think I liked it just a little better this time, but I can’t help thinking that this would be better used for making a terrific Mole sauce! Don’t you worry, I’ll return to this week’s mini-theme of restaurant reviews I forgot to tell you about, tomorrow! Hahaha! It”s the Chocolate time of the Year! I have never heard of Brooklyn Dark! I love me some vegan chocolate…Vegancuts.com here I come!!! Wow these bars sound very interesting.